On Episode 211 of CrossFit Radio, host Justin Judkins interviewed CrossFit 1525 owner Nikki Goldin and CrossFit Gymnastics subject-matter expert Jeff Tucker. This episode was webcast live at 6 p.m. PDT on Wednesday, Feb. 15, 2012. The WOW (Workout of the Week) is from CrossFit Fairbanks in Fairbanks, Alaska. 1:35 Nicole “Nikki” Goldin owns CrossFit 1525 in Houston, Texas. She has approximately 285 members and explained what she’s done to be so successful. Goldin talked about social media and using Facebook to build her community culture by uploading photo albums weekly. She described how she started CrossFit and how she has gained as much knowledge as possible through the CrossFit Journal and other people with more experience. As a successful affiliate owner, she gave advice to those who want to build a positive and connected culture at their own boxes. Finally, Nikki described what she plans on doing for the Reebok CrossFit Games Open and how she’s encouraged the average CrossFitters at her box to participate. 26:15 Jeff Tucker is CrossFit’s gymnastics expert, and the Texan has several big projects in the works. 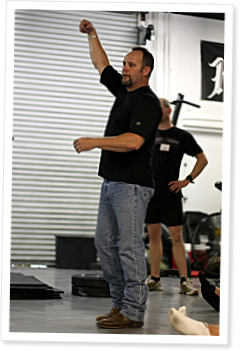 He described the space-saving “exercise sculpture” he has created to allow CrossFitters to do over 300 different exercises, and he also talked about putting the finishing touches on his book that will serve as a reference tool for CrossFitters looking to improve their gymnastics skills. Tucker went on to explain what his affiliate, GSX CrossFit, will be doing for the Open competition, then moved on to online coaching. As an in-demand coach, Tucker is experimenting with training athletes online, and he talked about the pros and cons he has seen in the short time he’s been doing it. When is someone going to fix in itunes? Much easier to use on the iphone from itunes then doing a work around. please fix the itunes trouble. Must say, I'm jonesing for new episodes, the itunes link is still down.